C919 aircraft completes 2.5g ultimate load static test__Commercial Aircraft Corporation of China, Ltd.
C919 aircraft completed 2.5g ultimate load static test on July 12th, 2018. Under the witness of CAAC representatives, C919 whole aircraft 2.5g ultimate load static test in maneuvering balanced operating condition was completed successfully at Shanghai Branch of AVIC Strength Research Institute in the afternoon of July 12th, 2018. With the ultimate load (150%) loaded and held for three seconds, the wing tip deformation of C919 AC10001 static test aircraft was nearly three meters. The deformation and strain met the analysis expectation, and the airframe structure met the load bearing requirement, which lays a solid foundation for the follow-up flight test and certification of C919 aircraft. Mr. He Dongfeng, Secretary of the Party Committee and Chairman of Commercial Aircraft Corporation of China, Ltd. (COMAC) and General Director of C919 Program, Mr. Zhao Yuerang, President of COMAC and Administrative Deputy General Director of C919 Program, Mr. Yang Shuanchang, Deputy Director General of Department of Equipment Industry of Ministry of Industry and Information Technology, Mr. Wu Guanghui, Vice President of COMAC and Chief Designer of C919 Aircraft, Mr. Gu Xin, Director of Shanghai Aircraft Airworthiness Certification Center of CAAC, and Mr. Wang Binwen, Director of AVIC Strength Research Institute, directed the test on site. Aircraft static test aims to verify the strength, the rigidity as well as the stress distribution of aircraft structure under the action of static load, and is an important means to verify the correctness of aircraft structural strength and static strength analysis. Static tests include limit load test and ultimate load test, and limit load is the maximum load to be expected in operation. 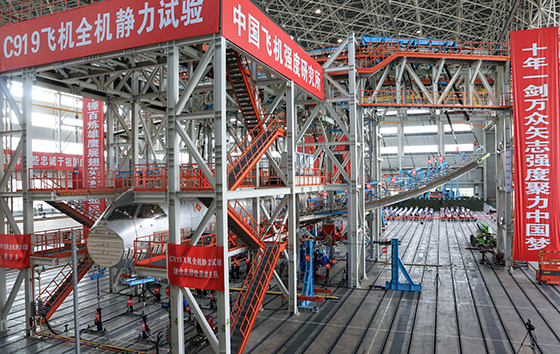 The severest stress condition experienced by the aircraft structure during operation is simulated in limit load test, and the deformation of the aircraft structure must not affect the safe operation of the aircraft. Ultimate load is 1.5 times of limit load, and is used for assessing the ultimate bearing capacity of the aircraft structure. Due to the stringent requirements of aircraft design on weight, the stress level of the structure at the assessment position is usually slightly lower than the critical point of aircraft structure failure. Therefore, ultimate load test is generally not repeatable, and must succeed in one attempt. C919 static test aircraft entered the test building of Shanghai Branch of AVIC Strength Research Institute on April 11th, 2016, and had completed 48 static tests before maiden flight by February 15th, 2017 during more than 300 days, which lays a foundation for the successful maiden flight of C919 on May 5th, 2017. The 2.5g ultimate load static test in maneuvering balanced operating condition is one of the severest tests in C919 full scale static tests, and is also a test with high difficulties and high risk acknowledged in the industry. During the test, one wing of the aircraft bore an upward load of nearly 100 tons. 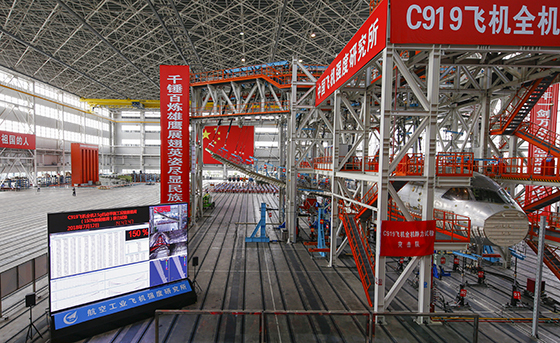 In the static tests of C919 aircraft, C919 strength test team adopted a number of new technologies, such as integrated bearing frame, slanting loading, floor beam loading systems, which ensures the efficient and high-precision implementation of the test; made full use of the analysis techniques such as fine finite element model and strength automation platform to identify and eliminate the risk points, which ensures the safety of the test parts; and adopted the test monitoring means such as real-time monitoring system and digital speckle technology to monitor the test process, which effectively controls the risk points in test. With the supervision and review of Shanghai Aircraft Airworthiness Certification Center of CAAC, the C919 strength test team composed of members from Shanghai Aircraft Design and Research Institute (SADRI) of COMAC and AVIC Strength Research Institute worked closely together with high level of attention, meticulous preparation and excellent ability to promote various kinds of test work. As planned, C919 AC10001 will also carry out a series of other static tests. 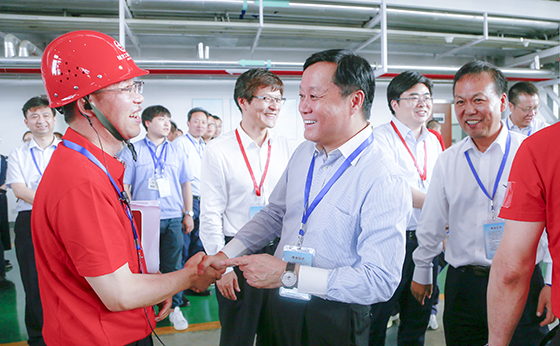 C919 strength test team will unite the power and take the most advanced airworthiness standards in China and in the world as the benchmark to ensure the safe and reliable flight of C919 aircraft in the blue sky. 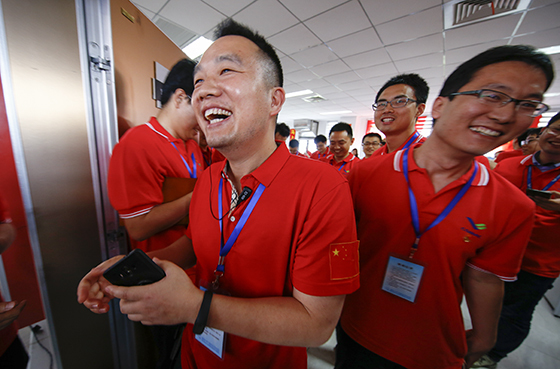 COMAC leaders directed the test on site on July 12th, 2018. Test data was closely monitored on July 12th, 2018. A photo taken after the successful test on July 12th, 2018. 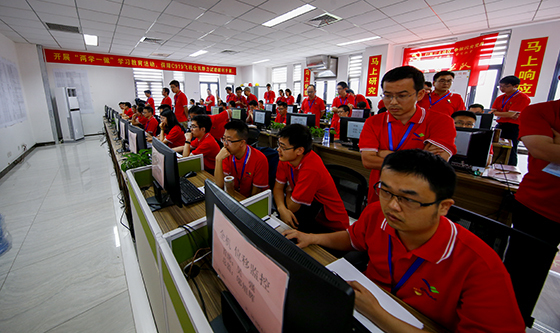 A photo of the joyful test personnel taken on July 12th, 2018.